The "Pearl Effect" - Maximum recovery and reproducibility with epT.I.P.S. LoRetention and ep Dualfilter T.I.P.S. LoRetention - No sample loss, reduced costs, improved results. epT.I.P.S. LoRetention pipette tips and ep Dualfilter T.I.P.S. LoRetention filter tips are particularly well-suited for applications with samples that contain detergents. Detergents or detergent containing liquids lower the liquid’s surface tension. This leads to a phenomenon called “wetting”: Residual liquid sticks to the tip wall and cannot be recovered. 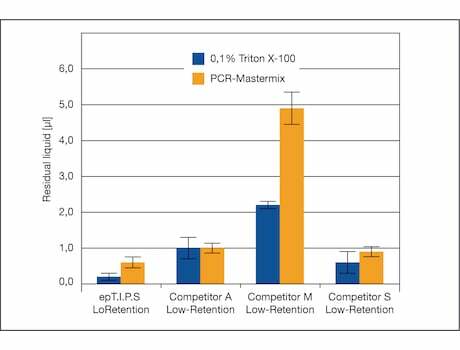 The invisible film left behind in standard tips shows a significantly high amount of valuable sample material, which becomes discarded together with the tip.Particularly when it comes to sensitive PCR and real-time PCR applications, low retention surfaces can increase the reproducibility and significantly reduce the loss of expensive reagents.The low retention property of epT.I.P.S. LoRetention pipette tips and ep Dualfilter T.I.P.S. LoRetention filter tips is generated by an ultrahydrophobic, extremely homogeneous surface. It is achieved through an innovative treatment at the molecular level – the “Pearl Effect” Technology. All pipette tips are uncoated, free of additives and do not leach into the sample. Liquids containing detergents simply roll off, so that practically no liquid remains in the tip. These outstanding material properties guarantee maximum sample recovery for cost saving and improved reproducibility. It goes without saying that the new epT.I.P.S. LoRetention and ep Dualfilter T.I.P.S. LoRetention pipette tips have all the valued prop erties of the proven Eppendorf epT.I.P.S.. They are produced in high-precision manufacturing processes, can be autoclaved and are extremely resistant to chemicals. This Eppendorf quality is also available in the PCR clean (free of human DNA, DNase, RNase, and PCR inhibitors) purity grade. For maximum contamination protection, epT.I.P.S. LoRetention pipette tips are also available as ep Dualfilter T.I.P.S.. In particular with sensitive PCR and real–time PCR applications low-retention surfaces can increase reproducibility and notably r educe the loss of expensive reagents - depending on the reagent solution, this can be by up to 5 %!epT.I.P.S. LoRetention pipette tips are ideally suited for all applications with samples that contain detergents:› PCR and real-time PCR preparation of enzyme solutions and master mixes› Isolation, purification and denaturation of proteins› Restriction digestions and ligations› Pipetting DNA ladders during gel electrophoresisIn our Application Notes 218 and 192 you find detailed results on the comparison of residual liquid from epT.I.P.S. LoRetention with standard epT.I.P.S. 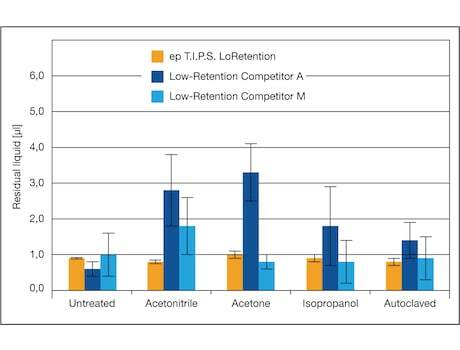 pipette tips and low retention tips of other manufacturers and the comparison of resistance of the low retention property when subjected to solvents or autoclaving. Both results showed best performance of epT.I.P.S. LoRetention with lowest residual liquid and smallest standard deviation.